“The crying stone begins to speak—Julie Andrews imperceptibly breathes, wonder melting to anxiety and back. The Bates Motel sign flickers, a warning of the dark road ahead.” Muriel Zagha talks to curator Lucy Newman Cleeve about Stations of the Cross and Stations of the Resurrection in the City of London. Video artist Mark Dean is known for his looping, incantatory appropriations of music and film references, which often reach towards spiritual transcendence. Unusually among contemporary artists, Dean is also an ordained Anglican priest, and his latest installation works, Stations of the Cross and Stations of the Resurrection, which, among other movies, quote from Psycho, The Sound of Musicand Alice in the Cities, are hallucinatory, metaphorical meditations on religious subjects viewed through the prism of cinematic codes. It was curator Lucy Newman Cleeve’s idea to bring Dean together with choreographer Lizzi Kew Ross to create an immersive installation within two imposing churches in London: St Paul’s Cathedral and St Stephen Walbrook. Could you tell me a bit about the genesis of this project? I met Mark Dean in 2011 at an Arts Council event about religion and art. We quickly recognized that we shared a sense of frustration with much of the contemporary dialogue about spirituality and art, where “spirituality” is used as an aesthetic term, devoid of any collective metaphysical basis, at times applied with such little precision as to be almost meaningless. We were both interested to find a more articulate translation between the languages of art and theology that did justice to both disciplines. I studied for a degree in Theology before training at the Royal College of Art and Mark had recently been ordained as an Anglican priest. 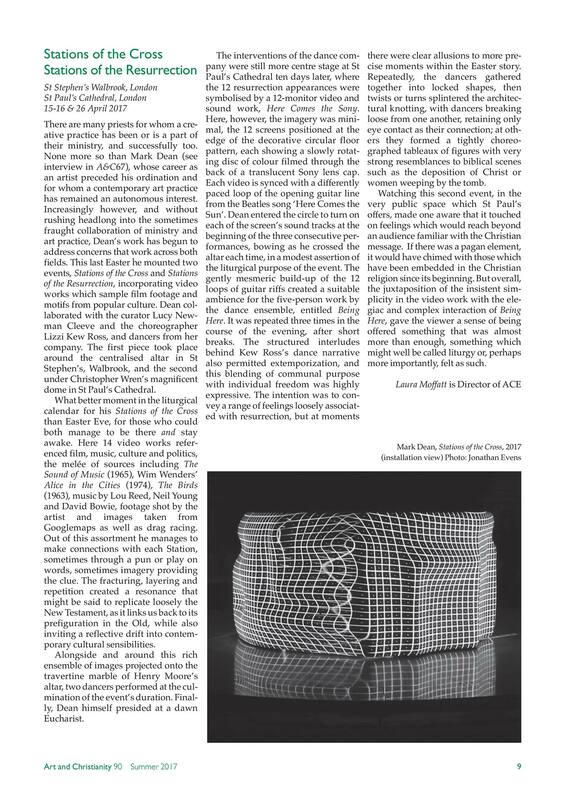 I included Mark’s work in Brittle Crazie Glasse which I curated at Islington Mill in 2012, and in On the (im)possibility of a pure praise poem at Man&Eve in 2013, which also included work by Dom Sylvester Houédard, Aliki Braine and Anna Sikorska. We first started discussing Stations of the Resurrection in 2014, but it was not until March 2016 that I introduced Mark to Lizzi Kew Ross, and suggested it would be interesting to collaborate on the project. I have known Lizzi for more than ten years (I was introduced to her by the artist Stephen Nelson, who knew of our shared interest in Christianity and art), although we had never previously worked together. Lizzi managed to open up a conversation with St Paul’s Cathedral that evolved over several months. Once the cathedral said yes to the project, everything else, including the funding and the relationship with St Stephen Walbrook, actually fell into place quite easily. What is the significance of its architectural context? St Stephen Walbrook and St Paul’s Cathedral were both designed by Christopher Wren to replace churches that had burnt down in the Great Fire. St Stephen Walbrook was Wren’s parish church, and in many ways it was the prototype for St Paul’s, above all its beautiful domed ceiling. There is a striking visual correspondence between the circular architectural motifs found in each church—particularly in the Henry Moore altar at St Stephen Walbrook—and the circular image in Mark Dean’s work Here Comes the Sony. The architectural, historical and visual-spatial elements of the two churches helped to tie together the two events and also provided them with an interpretive framework. How is the piece experienced by visitors? Stations of the Cross was experienced as an all-night vigil at St Stephen Walbrook on Easter Eve. Fourteen video works were projected on to the Henry Moore altar, interspersed with readings which members of the audience were invited to deliver, and space for meditation. The event culminated with a dance performance and dawn Eucharist. I focus on the central altar—a Flintsone meteor landed in the City—an oracle about to host the event. Speedy brain & impatient body let go, give in—are stilled. I am caught by the gravitational pull. The crying stone begins to speak—Julie Andrews imperceptibly breathes, wonder melting to anxiety and back. The Bates Motel sign flickers, a warning of the dark road ahead. The journey begins. An unhurried procession of chapters, silent pauses in the darkness, familiar & half-remembered clips reminding me of all-night screenings at the Electric Cinema as a child—Fellini, Freud & the Marx Brothers drifting in & out of my dreams & mis-memories. A sense of tumbling down a rabbit hole, transported to a world of stories with no beginning or end, just an infinite loop of magical middles. A feeling of being invited to a very special intimate & shared event. A generosity on the part of all the contributors, multiple references, poignancy & humour rarely embraced in an art gallery event. I walk home through the early awakening of London; the readings, the music, the images swirl around my brain. No hard sell. No self-congratulatory pomp. No applause to break the spell. I am left with the silence—not of something arrived but of something just left. Stations of the Resurrection was an evening performance under the dome of St Paul’s Cathedral. Five dancers from Lizzi Kew Ross & Co performed the premiere ofBeing Here in the midst of Mark Dean’s twelve-monitor video and sound installation, Here Comes the Sony. The event lasted two hours, during which time the dance was repeated three times. Rather than retelling the resurrection stories, Being Here explores the paradoxical themes and emotions contained within them, including presence and absence, innocence and guilt, hope and fear, commitment and betrayal, connection and loss, joy and grief. Each of the monitors transmitted the same circular image, produced by filming through the back of a translucent Sony lens cap, so that the logo remains visible in reverse. The soundtrack is fleetingly recognizable as the guitar riff from the opening bars to Here Comes the Sun by The Beatles, although the original track has been progressively extended so no two loops are the same duration. 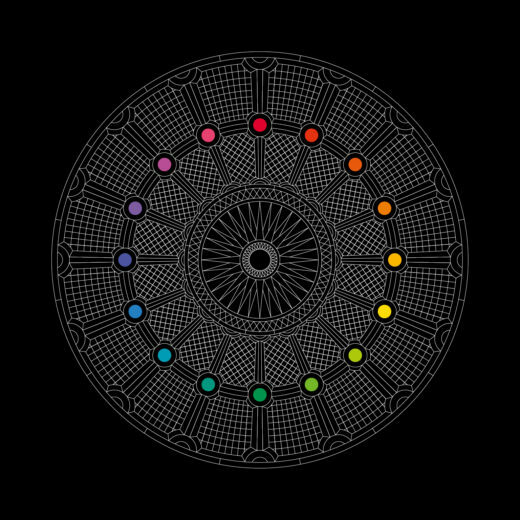 The circular images rotate at different speeds, in sync to the soundtrack, changing hue as they cycle through the colour spectrum. As the music builds, the particular melody of Here Comes the Sun is obscured, although never quite lost, as the sounds merge to create the effect of a peal of Easter bells. The twelve screens correspond to Jesus’ resurrection appearances in the New Testament and the sampled music from Here Comes the Sun by The Beatles is a deliberate pun referencing the coming of The Son, which is further reinforced by the retention of the reversed Sony logo. Mark Dean brings together the worlds of art and religion. How does this work engage with those two different languages? The content of the work is obviously rooted in Christian narratives surrounding the death and resurrection of Jesus. But each of the works shown as part of Stations of the Cross and Stations of the Resurrection could be exhibited independently within a fine-art or theatrical-dance setting—indeed, three of the video works have been exhibited previously in gallery settings. The context in which these works were shown clearly affected their interpretation. Mark took part in both events in a clerical and artistic capacity: during Stations of the Cross, he presided over the Eucharist and during Stations of the Resurrection he appeared at the beginning and end of each of the three performances, to activate the monitors. These incursions—along with the way in which the formal staging of the dance and the readings involved the audience—raised the question of whether these were performance art or liturgical events, or perhaps both. Is there a feminist dimension to the piece? All three of us would readily identify as feminists, and the representation of women throughout Mark Dean’s work is clearly significant. I think it’s fair to say that the work rehabilitates or affirms certain groups who have traditionally been marginalized or excluded by the church and by the spheres in which we operate as arts practitioners. The work deals with the representation and experience of “personhood” (irrespective of gender identification or sexual orientation) in a world in which there is a God. It’s also worth noting that Being Here involved some older dancers, as questions of age are equally important to this full expression of personhood. Over the Easter period, St Stephen Walbrook, was involved in Stations 2017, a two-part artwork based on the Stations of the Cross and the Stations of the Resurrection. The first part of this project involved the artist Mark Dean in projecting filmed Stations of the Cross onto the central, circular Henry Moore altar at St Stephen Walbrook throughout the night on Easter Eve. Mark Dean’s videos are not literal depictions of the Stations of the Cross, the journey Jesus walked on the day of his crucifixion. Instead, Dean appropriated a few frames of iconic film footage together with extracts of popular music and then slowed down, reversed, looped or otherwise altered these so that the images he selected were amplified through their repetition. 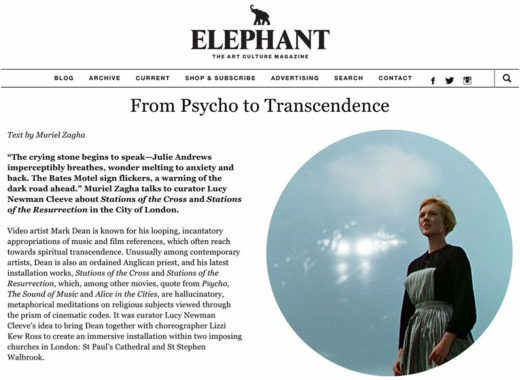 As an example, in the first Stations of the Cross video, a clip of Julie Andrews as the novice Maria from the opening scenes of The Sound of Music was layered over an extract, from the Alfred Hitchcock film Psycho, of a car arriving at Bates Motel where Marion Crane would be murdered by Norman Bates. The blue of the sky and the innocence suggested by Maria’s religious vocation was in contrast with the footage from Psycho, which was indicative of the violent death to which Jesus was condemned. In this way Dean brought images from outside church into church and made them central to the Easter Vigil by projecting them onto an altar which had been designed for people to gather as a community around the place where God can be found; the Eucharist, the central act of Christian worship, the re-enactment of Christ’s sacrifice. 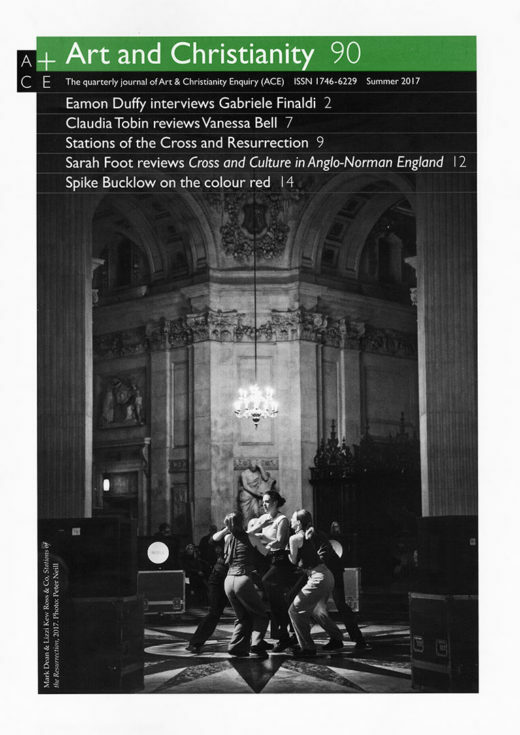 In St Paul’s Cathedral for the second part of the project, the staging was inverted as the dancers performed in the central space under the dome, whilst Dean’s video was played on television monitors placed around the edge of this circular space. The monitors appeared almost like a clock face marking out the boundaries of human experience. Five dancers emerged from the shadows around the edge of the stage and started to navigate the space, sometimes individually and sometimes in groups, to form tableaux which were visually reminiscent of the acts of protecting, comforting and carrying each other. The dancers regularly perforated the boundary, moving out beyond the stage and the audience, before returning to the centre and reconnecting in different configurations. As a result, the on-lookers found themselves within the action of these movements. As an artist-priest, Mark Dean inhabits the twin worlds of art and religion. These are often viewed as disconnected but have intersected in modernism more frequently and with greater interest and insight than is frequently acknowledged by art critics and historians alike. I asked Mark to explore some of these intersections as they relate to Stations2017. What was the genesis of this project? I’ve been looking for a way to make work for churches since I returned to making art in the early 90’s, which coincided with my getting confirmed as a Christian. In 1997 I made Scorpio Rising 2 (The Gospel According to St Matthew / Hells Angels on Wheels) which ten years later was installed in Berwick Parish Church as part of a film festival (and is available online at tailbiter.com/scorpiorising2 ) but otherwise I have been quite sceptical of contemporary art in churches, to be honest. I’m not interested in the idea of churches treated like funky gallery spaces, nor in the idea of art as a kind of cultural loss leader to get people into cathedrals etc. But it’s easy to be critical, and less easy to do something about that critique. I did have ideas for works designed for churches – for example, Stations of the Resurrection – but it wasn’t until I started working with other people, especially curator Lucy Newman Cleeve, that I was able to move forward in practice. It was Lucy who introduced me to choreographer Lizzi Kew Ross, and between us, we came up with the idea of an all-night art and dance collaboration for Easter Eve. This project began with an agreement for Stations of the Resurrection at St Paul’s Cathedral. The idea of and opportunity for showing the Stations of the Cross at St Stephen Walbrook came later. What do you think has added to the project? Actually, the original proposal was for a combined Stations of the Cross / Stations of the Resurrection in the crypt of St Paul’s, with people then coming up into the main body of the Cathedral for the Easter Eucharist. The Cathedral Chapter liked the idea but couldn’t accommodate us until the second week of Easter, by which time the Stations of the Cross would be past their sell-by for the year. So we agreed we would just do the Stations of the Resurrection in St Paul’s, and then St Stephen Walbrook kindly offered to take the Stations of the Cross. This meant that I could develop the idea of the Stations of the Cross as a liturgy, Lizzi could expand her choreographic ideas under the dome of St Pauls, and Lucy could draw out correspondences between the two churches in her writing about the project. In what ways have you taken the environment and aesthetics of the churches involved into account in planning this project? The video installation has been designed to reflect the circular space under the dome of St Paul’s, and the choreography has been devised in tandem with this, including the colours of the cathedral as used by the costume designer. The circular theme has also been developed by the graphic designer, and as already mentioned, by Lucy Newman Cleeve in her catalogue text. A very significant aspect was the decision to use the Henry Moore altar in St Stephen Walbrook as the projection screen for the Stations of the Cross. It didn’t occur to me to do so at first, perhaps due to my aversion to art that obscures or interferes with the function of a church. But once I saw that my work could potentially function as a kind of offering on the altar, then it became the obvious setting. Some of the films included as Stations were made before the Stations series was conceived and have been exhibited in galleries rather than churches. What effect does showing these works in churches have on the works themselves and what effect do the works have in the churches in which they are being shown? Would these films and performances have the same impact if they were in a gallery setting rather than in churches? Three of the works have been shown previously in galleries, but each of them was in exhibitions that were either explicitly concerned with the question of art and religion or were accompanied by talks on that basis. As already discussed, it is easy to show art in churches in which the context of the church is ignored except on some kind of surface level. But by the same token, it is possible to curate art in galleries that take the question of religion seriously – with some of Lucy’s shows being a particularly good example of this. So I don’t think it is necessarily the church setting per se that is the determining factor. Having said this, if the art in the church setting is seeking to engage with the liturgical function of the church, then it becomes a different matter. That is what we were trying to do with Stations of the Cross, as a vigil, that also worked as an art and dance event. Some texts used in the Vigil at St Stephen Walbrook related to the narrative of the Stations, others were meditations on the holy or sacred in art. What did these meditations bring to the project? First and foremost, readings are a traditional element in the liturgy of the vigil, and so all the texts had to function in this context. However, as you have noted, not all the texts were traditional in themselves. In fact, even the passages taken from scripture were not always directly related to the events of the Stations. However, many of the Stations do not have scriptural accounts. There were also readings from non-scriptural sources, many relating to contemporary artists including Gina Pane, Yves Klein and Andy Warhol, all of whom were Christians, and who made work related to their faith, even though they are not generally considered to be religious artists. As important as the readings themselves, was who read them – I asked people to read only a few minutes beforehand, so it was quite spontaneous, and also reflected the diversity of those present. To what extent is this project exploring the intersections between art and the sacred? Is this project exploring the Stations or exploring the sense of the sacred in art? That is a good question, but I don’t think I can really answer it in those terms. At the moment I am working as an artist, and a priest, and making art, and ministering. Within that, of course, I am exploring the questions you raise, but at this stage, I am happy to leave it to the work (art and ministry) to provide any answers. The Stations are the base materials for this project prepared prior to the project and performance while the dance elements are evolving within the life of the project. How do they relate to each other? That is probably more a question for Lizzi, the choreographer, but I can say that I have been greatly inspired by working with her and her company. Lizzi’s collaborative approach is based on working with the personalities of the dancers, but I notice this does not compromise her vision for the work. I also collaborate in a sense, by working with the existing cultural material, but it is a more mediated engagement. The films don’t illustrate the Stations and the dance doesn’t illustrate the films. What would you say are the various relationships between the different aspects of the project? What enables it all to hold together? Lucy Newman Cleeve has written very thoughtfully about this question in the catalogue essay and has framed it partly within the architectural relationship of the two Wren churches. For me, this echoes the relationship between the elements of my work, which often come together (eventually!) in quite surprising ways. It does sometimes feel like it’s not just up to me – that there is an underlying relationship that I am drawing out, or noticing. And so the collaborative basis of this project feels like an extension of that process. And this is confirmed by the fact that all three of us (and of course the churches we are partnering with) have a common relation in our Christian faith, despite our quite different approaches. So without making grand claims, I would say it is the Holy Spirit that binds it all together. Actually, this goes back to the previous question about the sense of the sacred in art. The late critic Stuart Morgan once said to me that the problem with the Modernist engagement with spirituality wasn’t that it wasn’t real, but that it was somehow exclusive – as though only artists were privy to the spirituality that generated creativity. Understanding the working of the Holy Spirit throughout the world helps us to avoid that kind of elitism, which can be understood as a form of Gnosticism.